This romantic decorative iron wedding arch is very popular for vow taking and can be used both indoors and outdoors, dressed or plain. We have beautiful decorations we can add to your arch making it extra special for your wedding day, including faux floral’s and faux garland. Bali flags are easy to setup and look absolutely stunning. Our Bali flag kit comes with everything you need (flags, telescopic poles, ground stakes, carry bag and instructions). Flags are available in white and come in two sizes, 5 or 7 metres. Our eco-friendly tropical bamboo wedding arbors are extremely popular for beach and park ceremonies. Created for stability in the inevitable breeze it’s perfect for outdoor use. It comes complete with everything you need for a quick and easy installation. Includes 2x 8m lengths of organza material draping in any colours of your choosing. Bamboo teepees are great for outdoor wedding decorations. They look amazing dotted around the ceremony. Includes a bamboo teepee, large floral arrangement, wrapping material, instructions and a carry bag. These black shepherd’s crooks are perfect to line up the aisle for any outdoor ceremony. They are approximately 1 metre high once pressed into the sand or earth. Extremely strong so you can hang anything from it. These elegant trees make a beautiful wedding aisle or top of aisle display. They come in white pots which can have white stones, moss or white fabric in them. These beautiful aisle stakes make any aisle look stunning. They can be decorated in your wedding colours and includes flowers and ribbons. They stand over a metre high once pressed into the sand or ground and are made of strong wrought iron. These freestanding shepherd’s crooks are great for indoor or outdoor ceremonies and are perfect for lining an aisle. They are very strong and you can hang lots of decorative items from them. These French iron flower stands are perfect for an aisle or entrance. DIY or let us provide the flowers for you. Elegant white iron and beautiful design. These elegant trees make a beautiful wedding aisle or top of aisle display. Dressed in pretty organza and satin ribbons with pearls. They come in white pots which can have white stones, moss or white fabric in them. This stunning French iron wedding arch has a romantic elegance. Beautiful to be used without any decorations or can be dressed to impress. Easy to assemble. Can be used for many different themed weddings including traditional, rustic, boho, beach and more. 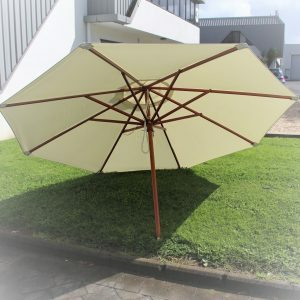 White market umbrellas are ideal for sunshade or rain cover. These are extremely popular for outdoor weddings and events. Includes a base stake that inserts into the ground and are very easy to setup and packdown. Large golf umbrellas are ideal for rain protection but can also be used for sunshade. Large enough to be shared with someone. These beautiful lace parasol umbrellas are great for shade protection and look stunning in wedding photos. Available in white and ivory. This stunning arch comes completely decorated with boxwood and white roses. Perfect for creating a magical ceremony space and looks fantastic in photos. 3 connecting parts for easy transportation. Modern, contemporary style planters are great for an entrance way, aisle or ceremony decorations.